Relaxation is basic to everything we do with our horses. It can be both a mental and a physical challenge, something riders must constantly work at achieving in both themselves and their horses. In the moment when a horse's muscles tense and he feels like he wants to run or buck, most riders unconsciously join the horse by tensing their muscles, too. 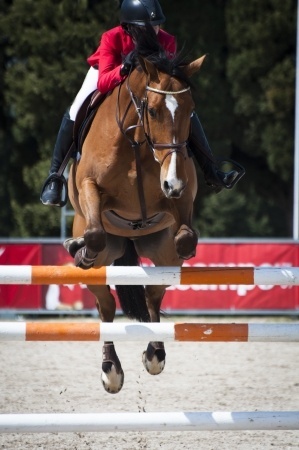 The reverse situation occurs when a tense rider makes the horse uncomfortable and tense. So relaxation is a chicken and egg thing. It does not really matter 'who started it.' In order to break the feedback loop, someone has to be the grownup. Goldie oldie school horses take on this role for beginning riders but most horses are not goldie oldies. As riders progress they must become responsible for establishing and maintaining relaxation in their partnership with the horse. They must learn how to break the feedback loop by staying relaxed and inviting a tense horse to join them there. It helps to have a tool kit to reach into when relaxation just is not happening. The suggestions for creating relaxation listed here can guide you in developing a personal program that works for you and your horse. Work up a short groundwork program that helps you relax before you greet your horse or mount up. Choose another set of under saddle tools that can help your horse warm up and develop relaxation before you go to work that day. Choose a program suited to whatever training and fitness levels each of you have achieved. And remember that horses are different from day to day and so are riders. Plan those adjustments into your program. Use horse-logical heeding skills to catch and groom the horse in a rhythmic, relaxed way. Once you are with the horse physically, stay with him mentally. Put the cell phone down and concentrate on your horse. Talking to someone and concentrating on the horse at the same time is a learned skill. Keep your concentration on the horse at all times. Be alert for signs of pain, stiffness or other discomfort as you groom and tack up. If your horse tends to be stiff at the beginning of a ride, develop an in-hand routine suited to his individual issues that allow his muscles to warm up and relax before you mount. Give him a short warm-up massage. If your horse is not respectful or attentive as you prepare to ride, work him from the ground in a rhythmic, relaxed way until he can focus on you before you mount. If your emotions get hooked because of the horse's resistance or inability to relax, learn to control your emotions and relax yourself. If you cannot calm down and relax yourself, then put the horse away and try again later. Lead the horse to the arena in a rhythmic, relaxed way. Pay attention to your horse and keep the horse on your aids. If you travel to a show, arrive early enough to lead the horse around the grounds. Keep the horse on your aids and make sure to show him anything that might be scary or unusual. Do not mistake tired for relaxed. Getting and keeping a horse on the aids is the key to relaxation. A horse longed until he is tired often becomes a tense horse just the same. 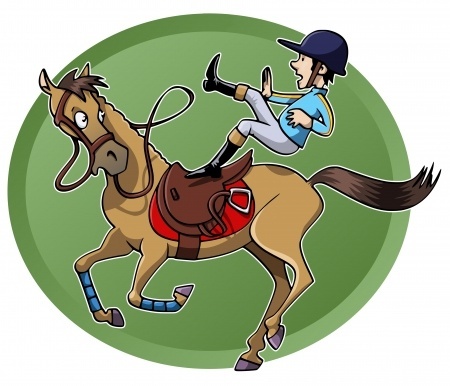 Ask the horse to yield to the leg on one side, then the other. Ask the horse to enlarge on a circle, relaxing the neck and jaw on that side. Ride with normal contact for a few strides, release slightly for the same number of strides, return to normal contact. Rhythmically repeat this sequence. Work in circles that spiral out and spiral in. Ride in serpentines. If a horse is fussy or resistant to your rein or leg aids, emphasize your core muscles to rate his speed and to stop. Use your hips to indicate direction while keeping your lower back muscles relaxed. Do some lateral work (leg yield, shoulder in, etc.) followed by going forward and straight. Do a turn on the haunches and/or a turn on the forehand in each direction to encourage reaching and stretching as the horse's legs cross over and to ask for obedience to the leg aids. Focus on riding the horse from back to front. As your driving legs ask the horse to move into your steady hand, feel for the connection between them. This encourages the back to relax and swing. Focus on riding the horse from back to front. Drive the horse into a steady hand. Look for a connection to the hand from the driving leg. This encourages the back to relax and swing. Do walk-halt-walk transitions to get the horse on the aids. Then do walk-trot-walk. Then trot-canter-trot. Then walk-canter-walk. Work transitions within the gait. Walk the horse over cavaletti or another type of grid to focus his attention. Encourage the horse to stretch the neck and back over the cavaletti. Reward the smallest sign of relaxation by releasing your aid pressures, however slightly. The greatest reward to the horse is the release of pressure. Take a class in things like yoga, tai chi, or dance to help develop strong core muscles and learn to feel the use and relaxation of different muscle groups. Find exercises that include balance, breathing techniques and stretching rather than focusing only on muscle strength or aerobic conditioning. 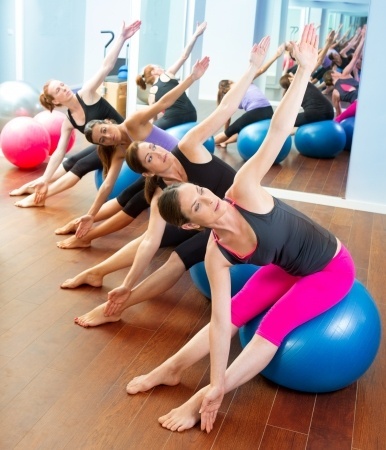 Develop better balance by adding exercises on a balance ball, balance beam, wobble board or similar exercise aids. Learn to keep your balance by alignment of the shoulders and hips. Establish a relaxed attitude before you approach and groom your horse by checking your breathing, softening your eyes and checking your body for any tension. Find a technique that works for you to release that tension. Counting to 10 as you breathe in and then out. Become more aware of your breathing. Breathe rhythmically as you groom, tack up, and ride. Note how your breathing affects your horse as you work with him on the ground. Learn to breathe through anxious moments without holding your breath. Mentally preview your ride before an event. Plan your strategy in advance. Plan your backup strategy in advance. Repeat until you can visualize a successful ride consistently and confidently without imagining any errors. Be sure to stick to your plan. Find and go to your favorite relaxation zone before a show class - listening to certain music, a short meditation or breathing routine, a stretching routine, or a final discussion of your riding plan with your coach. End your personal relaxation routine with a gesture you can use as a quick cue to 'relax' when you do not have time for your whole routine. It could be a very deep breath followed by a long sigh. It could be a phrase like, 'Here we go!' or 'Let's do it!' Make sure your cue is something that is always available to you - not a lucky charm you might forget to put in your pocket! If a fall or other accident has you fearful, ride a goldie oldie at the barn a few times to help rebuild your confidence. Work on your seat. Take lessons on a longe line without reins or stirrups to develop better balance and greater ability to follow the horse's motion while staying centered and relaxed. If fear or doubt interferes with your ability to focus or to breathe rhythmically, count in a rhythm or sing a nursery rhyme that has a steady beat. If you find muscles and joints tensing as you ride, take a moment to release that tension. Lift shoulder to ears and release them. Lift thighs away from the saddle and slowly lower them back. At halt, stretch across the horse to touch your fingers to your toes on the opposite side. 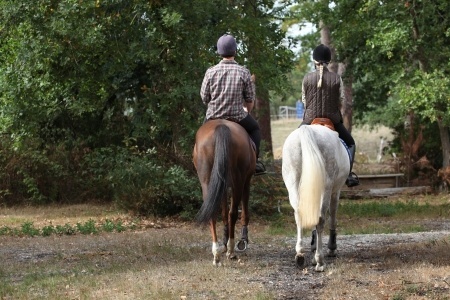 Stretch forward toward the horse's ears and backward toward the tail with each hand. Flex and extend your wrists, flex and extend your ankles. Draw circles with your toes. At a show, stay in the rhythmic, relaxed mindset you established while grooming and tacking up as you do your final tack check at the arena before mounting. Stay focused and leave the cell phone at the stall. Remember, concentrate on your horse and keep talking to a minimum. Do a quick scan for any tension you may be holding in muscles and joints before you head through the in gate. Use the 'tense and release' method to let that tension go. If something does not go according to plan as you ride a test or course, use your relaxation cue or set point to help you stay relaxed and focused. Don't dwell on the mistake. Redirect your focus to the next movement or jump. Ron Meredith talks about making yourself the safest place for your horse to be. In the horse's mind, a place where he can feel relaxed is a safe place. Working on relaxation begins the moment you open the horse's stall door and continues until you put him away after your ride. When you develop routines to help yourself stay relaxed and to help your horse stay relaxed, you become a safe place. You become the place where the horse wants to be. These lists are by no means exhaustive. Talk to your coach or instructor for other suggestions and for ways to create a program that works for you and your horse. Keep searching for the most appropriate 'reset' buttons to help both you and your horse become and stay relaxed throughout any ride. When your ride starts with a short relaxation routine, that becomes a 'safe place' you can return to any time things start going south during your ride. Your turn! Let us know how you achieve relaxation in yourself and your horse in the comments below. Meredith Manor is an equestrian career college dedicated to preparing students for hands-on, equestrian careers as trainers, instructors, equine massage therapists, stable managers, farriers and more. If you want a career with horses and are considering attending Meredith Manor, request an information packet to learn more. Meredith Manor is what every trainer in this country should be REQUIRED to attend. There is not one program that will better prepare you for a career in the industry. I have been all over the world and back riding horses and I would not have made it through 90% of it if I had not completed the entire Riding Master VI.